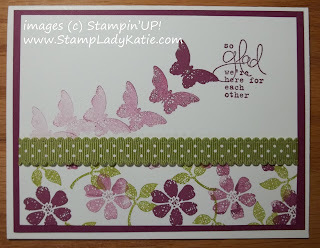 StampLadyKatie.com: Stamping Off is Booomin' Marvelous! 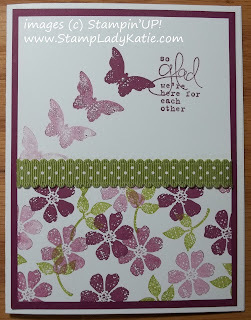 Stamping Off is Booomin' Marvelous! Here is a marvelous technique: Stamping Off. 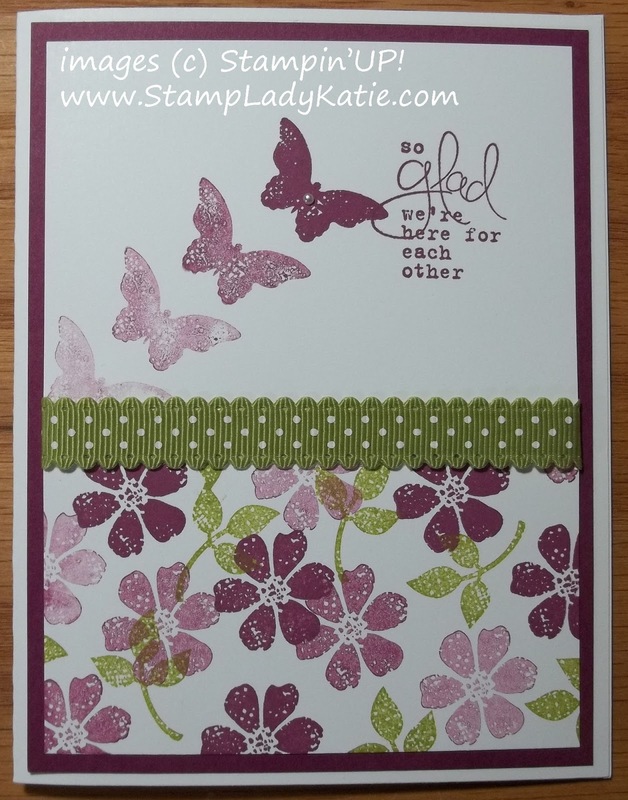 This sample is made with a stamp set called Bloomin Marvelous. The reason this technique is so marvelous is because Stamping Off is such an easy way to simulate motion or to add depth to a project. Stamping Off is a technique where you stamp multiple times without re-inking. This humming bird was stamped first near the bloom so the ink is darkest there. Then without reinking, it was stamped in the middle and then again on the left. Each image is then lighter than the previous one. For the bird it gives the illusion of motion. In the next few examples the butterfly was "Stamped off", again giving the illusion of motion. The flowers on the bottom 2 cards were also stamped off. The effect with the flowers is to give multiple shades from just 1 stamp pad. The stamped flowers and leaves almost look like a Designer Paper! All of these images come from a Stamp set called Bloomin Marvelous. This set is just perfect for showing off this technique. And I love the font for the sentiments in this set - its so elegant. 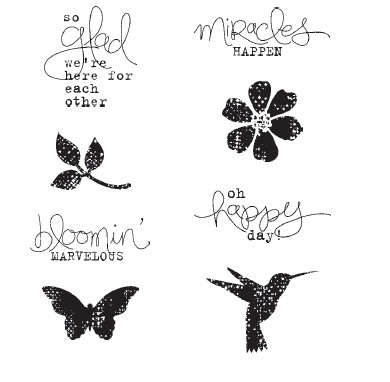 Bloomin Marvelous is one of the 2013 Sale-a-bration stamp sets. If you love birds and butterflies you're going to want this one for sure. It has such gorgeous writing, the sentiments are versatile and the butterfly and humming bird are beautiful . . . AND the butterfly goes with the new Bitty Butterfly punch. Bloomin Marvelous is EXCLUSIVE to sale-a-bration. That means that you can't buy the set - but you can get it for FREE! During Sale-a-bration each $50 purchase earns you a free item from the Sale-a-bration brochure. 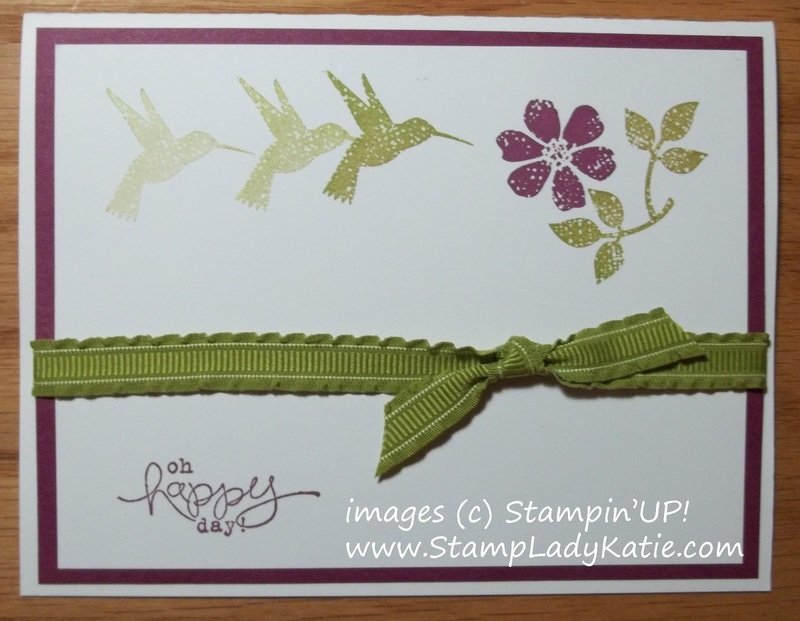 Purchase your Stampin'UP! products here.